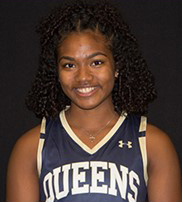 Bermuda’s Maha Clark scored for the Queens University of Charlotte field hockey team as they recorded a 8 – 0 victory against Molloy College. The school’s match report said, “The Queens University of Charlotte field hockey team welcomed Molloy College [0-11] to Bessant Field winning 8-0 over the Lions. The Royals improve to 4-7 on the year with the shutout victory. “Kayleigh Lawrence, a senior, led the Royals in their scoring efforts today with a hat trick while Maha Clark, Abby Carls, Korey Fine, Jill Sherman, and Renee Smith each tallied one goal. Miranda Childers played 70 minutes in goal notching one save. “The Royals got going early as Lawrence found the back of the cage twice in the opening 10 minutes of action to put the home team in front 2-0. Fine would net Queens’ third of the day soon after and the 3-0 score held until the halftime break. Molloy goalkeeper Tara Byrnes totaled 14 saves in the period.